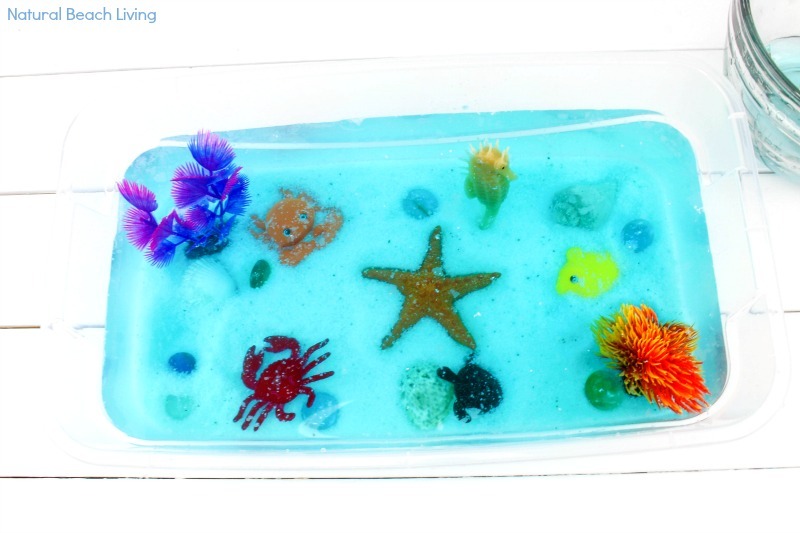 An Ocean Sensory Bin is such a fun way to start learning about the ocean and what can be found under the sea. 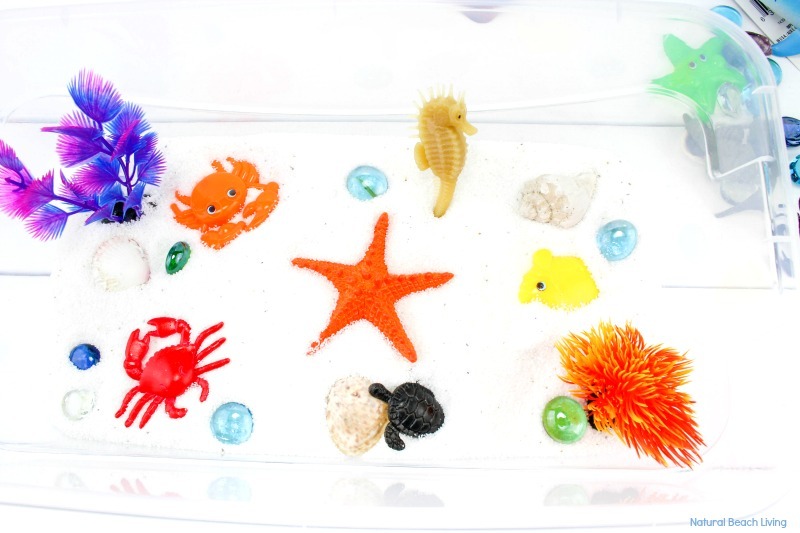 Sensory bins are so easy to put together, and kids can spend hours playing with them. 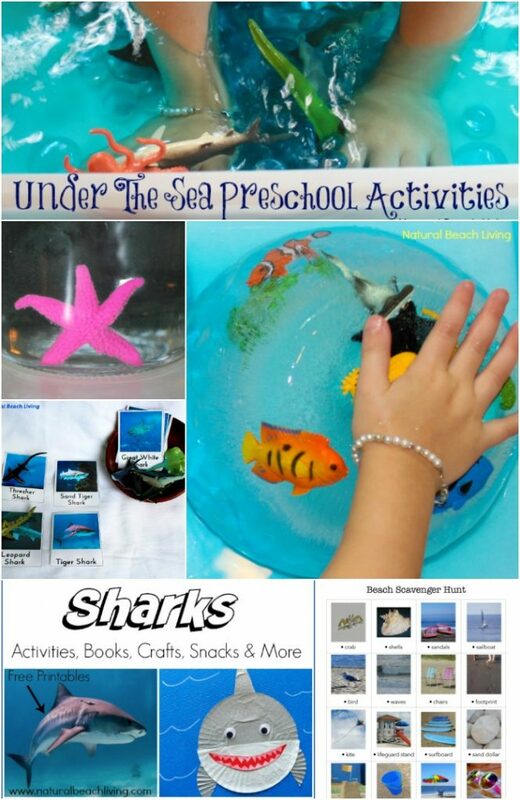 During the summer months, we love including under the sea activities and ocean themes as part of our hands-on learning. 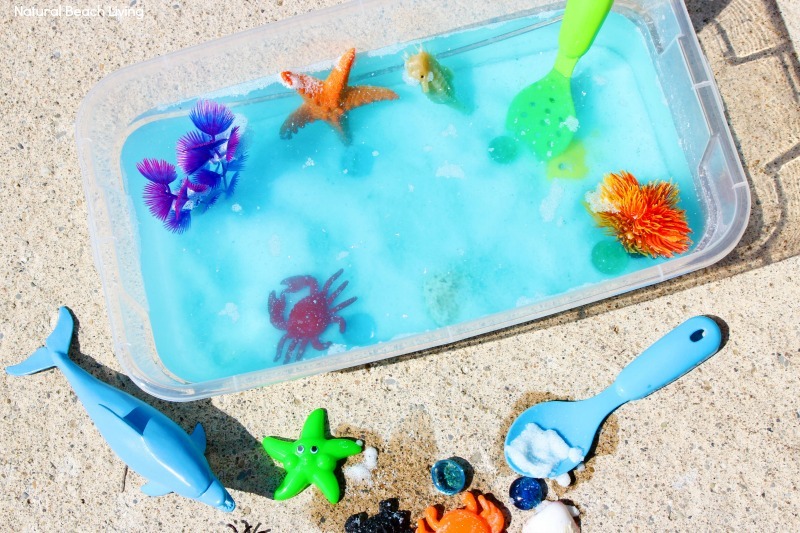 They are the perfect themes for those hot summer days. Children learn so much through hands-on activities that ignite their senses of sight, sound, touch, taste, smell, and movement! That is why we love including sensory bins into a variety of themed learning. 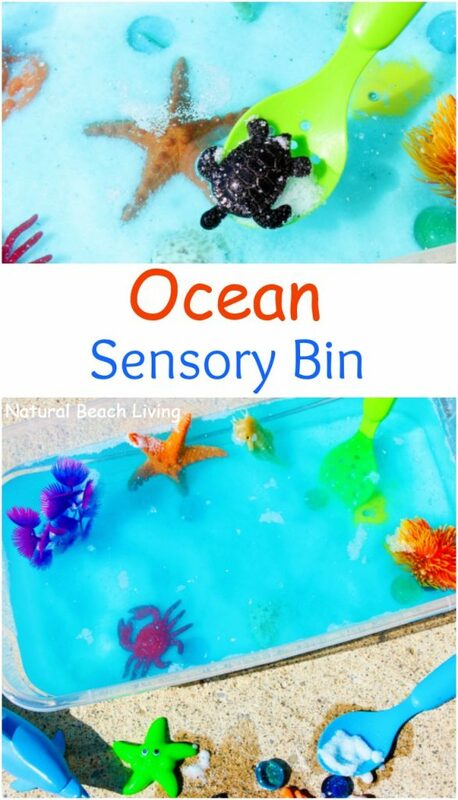 What you will need to make your Ocean Sensory bin is in this picture below. However, I have it displayed in list form towards the bottom of the page. Enjoy! 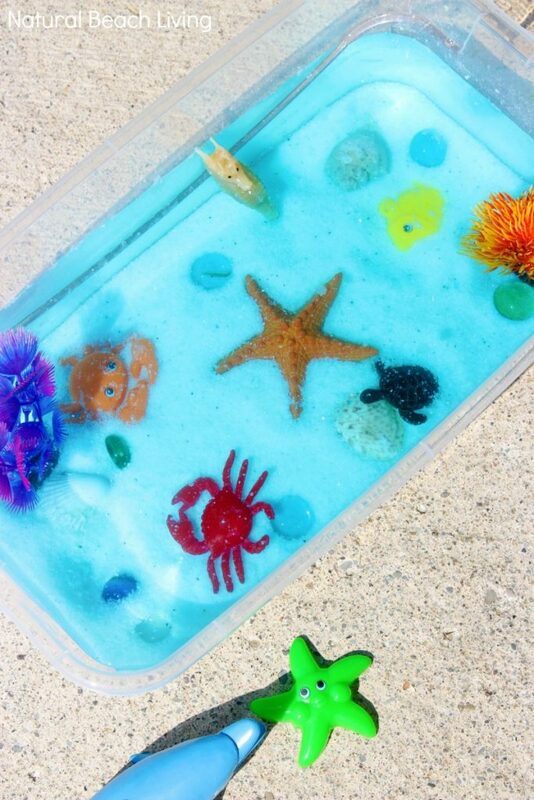 This ocean sensory bin is also a great idea for an under the sea themed birthday party or summer playdate idea. 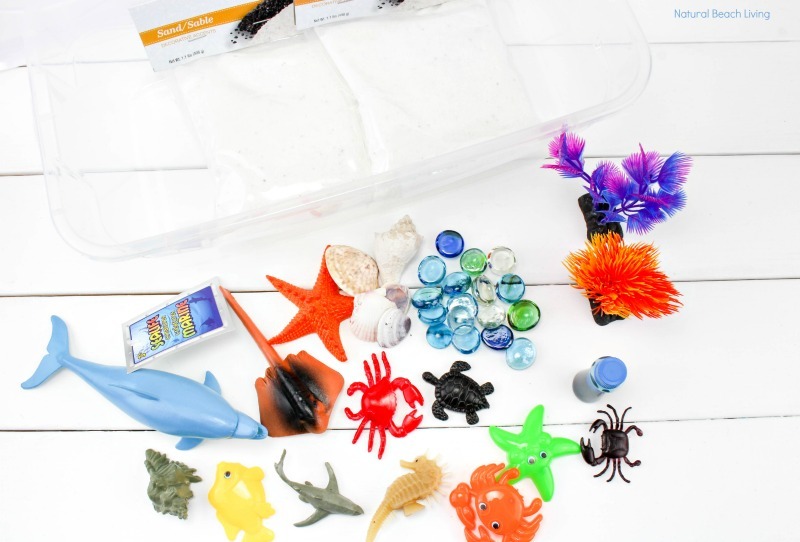 By adding sand, blue water, glass beads, sea glass, sea shells, ocean animals, and any other under the sea item you can think of you’ll easily create an enjoyable ocean activity. 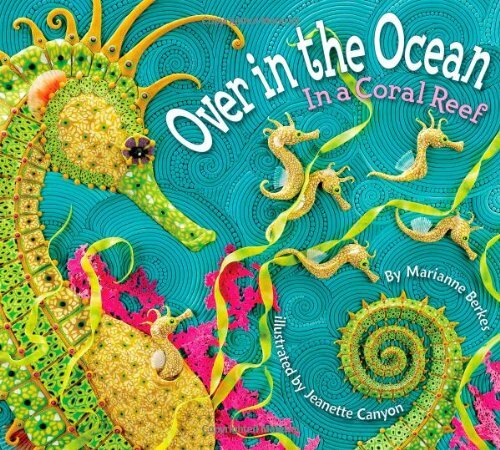 This is such a fun ocean sensory experience for toddlers and preschoolers. 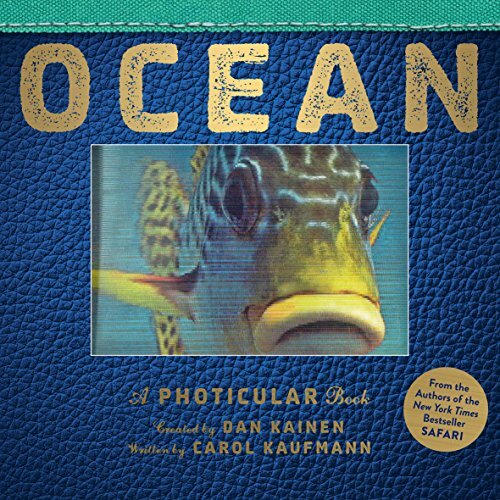 As long as you are close by (for the little ones), it’s safe for splashing, scoping, digging for treasures, swimming your fish through the sea and more. 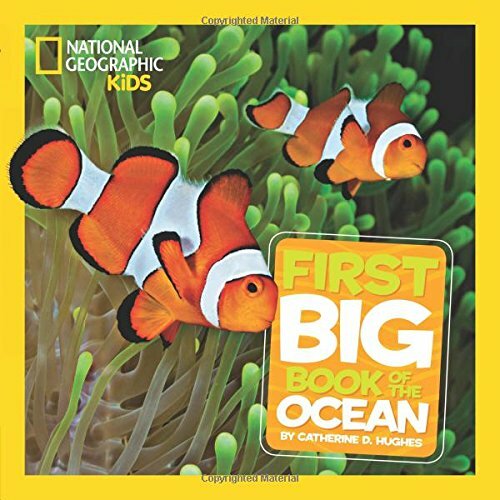 Your child will have so much fun with this. 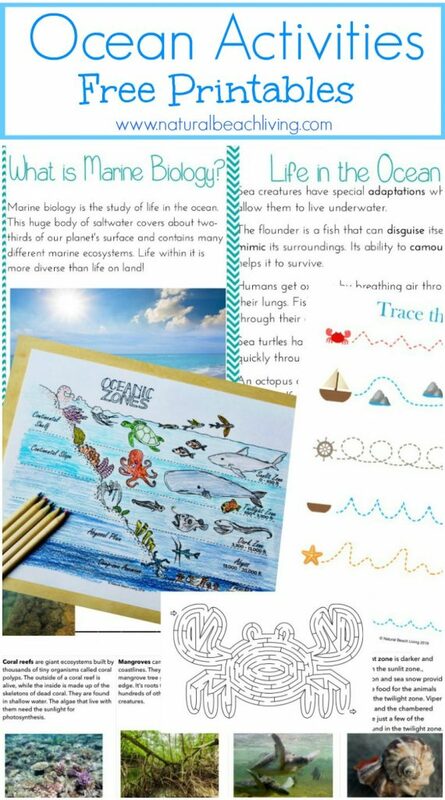 You can find our Ocean Themed Sensory Science Table by clicking here. 1. 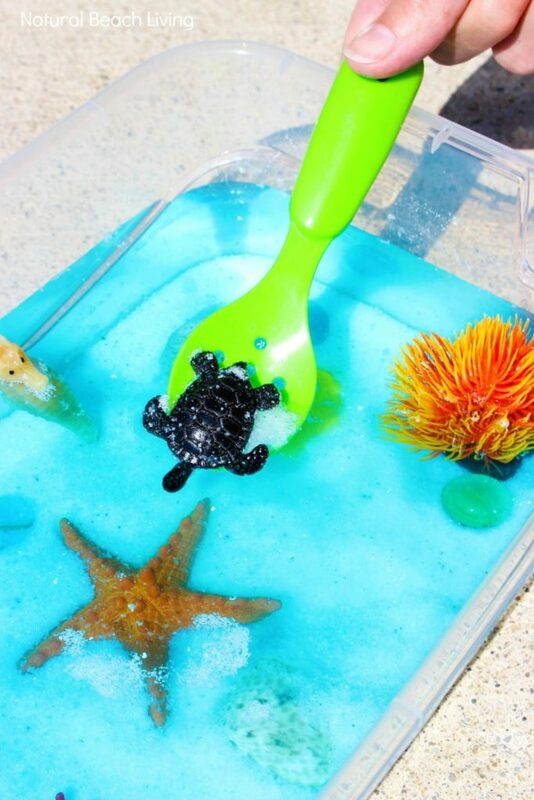 Pour the sand into the container, so it is at least 2 inches deep. 2. 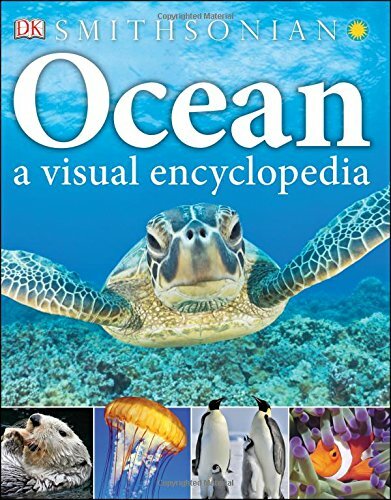 Put all the ocean animals, stones, plants, and shells into the sand. 3. 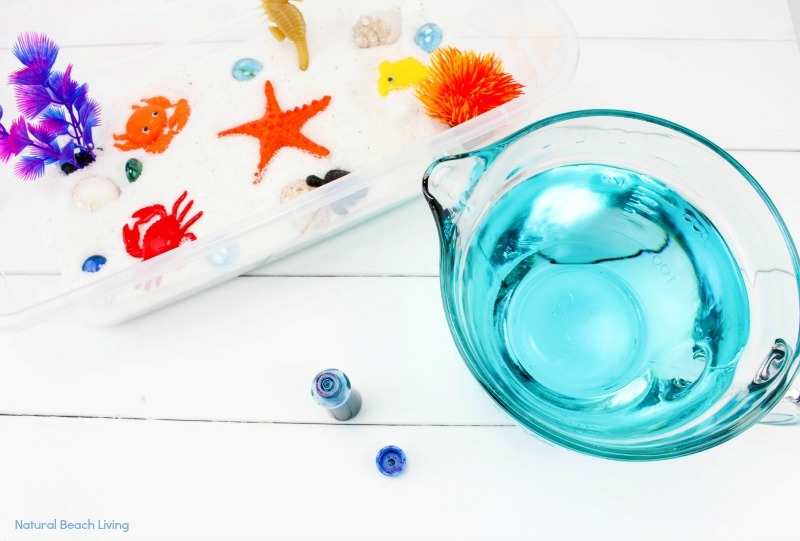 Tint your water with the blue coloring and pour it into the container as high as you would like it to be. 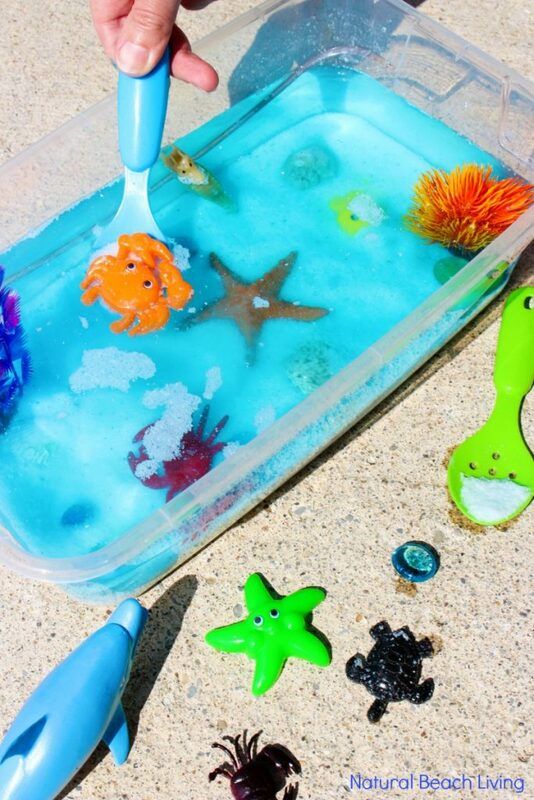 Kids can use their hands or small scoops or shovels to dig for ocean life. 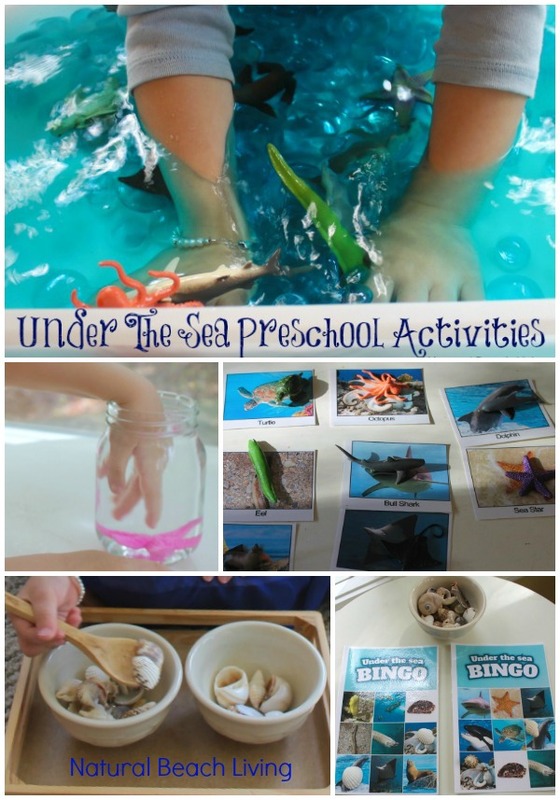 This is such a great summer activity! 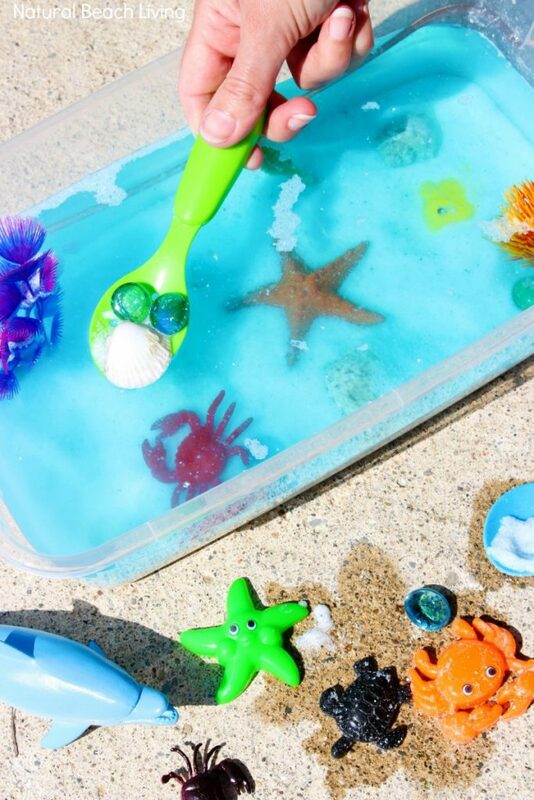 You don’t have to live near the beach; you can bring the beach and ocean to your children by creating an ocean sensory experience. Have fun!